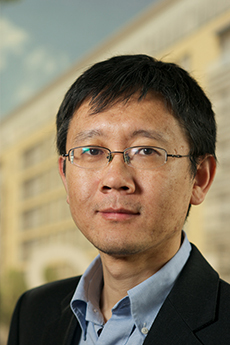 Dr. Zhenyu Li’s current research focuses on the development of novel biosensors and medical devices using micro and nanotechnology, namely microfluidics, MEMS, nanophotonics and flexible electronics. His current projects include a handheld automated blood analyzer using microliter blood samples, a wearable ECG sensor on a finger ring, and soft robotics with embedded medical sensors and actuators for automated healthcare delivery. A. Guan, P Hamilton, Y Wang, M Gorbet, Z.Y. Li, K.S. Phillips, "Medical Devices on Chips", Nature Biomedical Engineering, 1, 0045 2017. A. Guan, Y. Wang, K.S. Phillips, Z.Y. Li, "A contact-lens-on-a-chip companion diagnostic tool for personalized medicine", Lab Chip, 16(7), 1152-1156, 2016. B.C. Li, L. Li, A. Guan, Q. Dong, K.C. Ruan, R.G. Hu, and Z.Y. Li, "A Smartphone Controlled Handheld Microfluidic Liquid Handling System", Lab Chip, 14 (20), 4085 - 4092, Aug. 2014. B. Zhang, Q. Dong, C.E. Korman, Z.Y. Li* and M.E. Zaghloul*, “Flexible packaging of solid-state integrated circuit chips with elastomeric microfluidics”, Sci Rep. 3: 1098, 2013. Guan, A. Shenoy, R. Smith and Z.Y. Li, "Streamline based design guideline for deterministic microfluidic hydrodynamic single cell traps", Biomicrofluidics 9, 024103, Mar. 2015. Y. Wang, A. Guan, I. Isayeva, K. Vorvolakos, S. Das, Z.Y. Li, K.S. Phillips, "Interactions of Staphylococcus aureus with ultrasoft hydrogel biomaterials", Biomaterials, 95, 74-85, 2016. Z.Y. Li, "Optofluidic Resonators and Sensors", Encyclopedia of Nanotechnology, 1-6, 2016. Guan, Z.Y. Li, K.S. Phillips, "The effects of non-ionic polymeric surfactants on the cleaning of biofouled hydrogel materials", Biofouling, 2015. J. Frey*, A. Guan*, Z.Y. Li, S. Turtil, K.S. Phillips, Hemoglobin assay for validation and quality control of medical device reprocessing. Analytical and Bioanalytical Chemistry, Volume 407, Issue 22, pp 6885-6889, September 2015. *Equal Contributions. J. Silver, Z.Y. Li, K. Neuman, "Tethered-Bead Immune Sandwich Assay", Biosensors and Bioelectronics, Volume 63, Pages 117–123, 15 January 2015. Guan, Z.Y. Li, K.S. Phillips, "The Effect of Fluorescent Labels on Protein Sorption in Polymer Hydrogels", Journal of Fluorescence, Volume 24, Issue 6, pp 1639-1650, DOI: 10.1007/s10895-014-1450-8, November 2014. N. Kotagiri, Z.Y. Li, X. Xu, S. Mondal, A. Nehorai, and S. Achilefu, "Antibody Quantum Dot Conjugates Developed via Copper-free Click Chemistry for Rapid Analysis of Biological Samples Using a Microfluidic Microsphere Array System," Bioconjugate Chemistry, 25 (7), pp 1272–1281, June 2014. X. Xu, Z.Y. Li, P. Sarder, N. Kotagiri, and A. Nehorai, "Simultaneous detection of multiple targets using optimized microfluidic microsphere-trap arrays," J. Micro/Nanolith. MEMS MOEMS. 13(1), 013017, March 2014. X. Xu, Z.Y. Li, and A. Nehorai, "Finite element simulations of hydrodynamic trapping in microfluidic particle-trap array systems," Biomicrofluidics, vol. 7, 014305, Sep. 2013. B Zhang, Z.Y. Li, CE Korman, ME Zaghloul, "Rectangular CMOS differential MAGFET biosensor for magnetic particle detection", IEEE Transactions on Magnetics, 49 (7), 4052-4055, 2013. X.X. Xu*, P. Sarder*, Z.Y. Li*, and A. Nehorai, "Optimization of microfluidic microsphere-trap arrays", Biomicrofluidics 7, 014112, 2013. Reviewer of grants submitted to NSF and NIH. Reviewer of conference papers for the Annual International Conference of the IEEE Engineering in Medicine and Biology Society. IEEE Journal of Sel. Top. Quant. Electron.